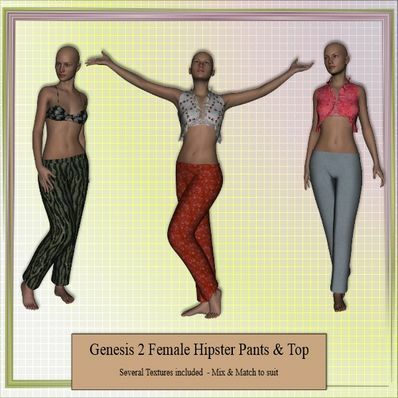 Hipster Pants, Frilled Top & Bra for Genesis 2 Female for use in Daz Studio 4.6. Jumpin' Jack Flash...it's a gas, gas, gas! Thanks! I like al your clothings. They are the best. They fit perfectly on Genesis and the loading procedure for the different materials is the only one that I understand. Thanks. Many thanks for sharing this fantastic outfit. You make beautiful things, thank you.